Aileen Blackwell Stanley, 87, of Asheville, went to be with the Lord on Wednesday, February 13, 2019. A native of Brevard, she was the daughter of the late James and Hattie Teague Blackwell. For many years she was a faithful member of Gashes Creek Baptist Church. A loving and faithful mother, she met everyone in her life with kindness and grace-filled compassion. She was a gardener and a gifted seamstress for Vanderbilt Shirt Company. 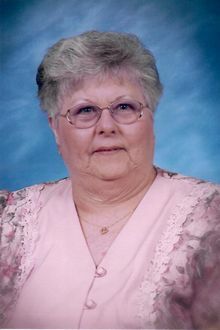 "Nanny Plum", as she was affectionately called by her grandchildren, made the best Chicken 'n Dumplings and loved music. In addition to her parents, she was preceded in death by her husband, Arvon Perry Laughter, Sr.; brother, James "Bud" Blackwell; and infant sister, Lola Mae Blackwell. She is survived by her children, Arvon "Butch" Laughter, Jr., Michael Laughter, Debra (Eric) Metcalf, and Terrence (Linda) Laughter, Sr.; sisters, Shirley Blackwell, Betty Helton, and Myrtle Blackwell; 11 grandchildren, 7 great grandchildren; 4 nieces and nephews; and 3 great nieces and nephews. The family will receive friends on Sunday, February 17th from 2:00-4:00pm at Grassy Branch Baptist Church, Asheville. A Funeral Service will be held at 11:00am on Monday, February 18th at Grassy Branch Baptist Church with Revs. Joel Burton and Michael Long officiating. Burial will follow at Forest Lawn Memorial Park, Candler. Moore Funeral Home at Forest Lawn is assisting the family. Please visit www.moorefh.net to sign the online guest book.